Well let's hope it'll be good then. A very poignant moment, particularly now. Doesn't hurt to ask. So I will, now. Obligado's presence will be felt in the core story, though, either way. I've not correspondended with Murph in a couple of years, but he's always been easy to converse with. I have good news. Steve Murphy has agreed to write a new Obligado short story which, of course, will be illustrated by Jim Lawson. And Obligado will otherwise be a key point in the main story anyway. Nice logo Andrew, and I'm glad to hear you got the extra story bit. I can already see the book sitting by my shelf next to Odyssey (which I can't wait to get). Any other special guests planned/thought about for the book in terms of writing/art? That's great! Thanks for reaching out to Murph and making this happen! He indicated it will close the loop on Obligado. And he's taking some notes as to how to tie it into the greater goings on in Origin. Very awesome that he'll be a part of this. The main story of Origin will be all lavish digital color. Should the 5 or 6 page (or whatever it ends up being) Murphy/Lawson Obligado piece be in B&W with duotones or should it also be in the same lavish digital color? My gut wants to make it in B&W with duotones to keep form with the other Obligado pieces but I'm curious what you folks think. I agree. B&W makes with the sense. Me 3. Keep it consistent. So awesome he's agreed to wrap it up! EDIT: any specific reason why you're going with color for "Origin," Andrew? Not knocking the choice, just curious? Last edited by funatic; 08-30-2014 at 10:54 PM. B&W not only for consistency with other stories but for INconsistency with Origin since Lawson is involved with both. So if someone gets it in hand and want to IMMEDIATELY read the last Obligado story they can know to skip to B&W pages without fear of reading Origin's ending. 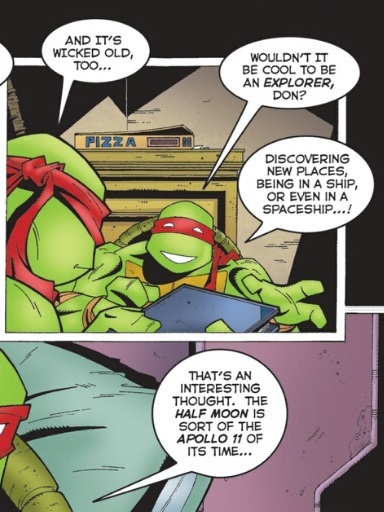 It's nothing new for Mirage TMNT. Volume 2 was that, and IDW is recoloring all of that older stuff anyway. But for this, it's some pretty larger than life stuff. Deep space travel, nebulae, cosmic forces and entities and rays... in B&W, even digital duotoning, a lot of the full effect I have in mind would be lost in a story like this. Plus I don't feel like Jim Lawson's art has ever really been given a fair shake at some modern digital lavish coloring in a longer form. I want to make that happen. While I was never huge on Obligado, I love Murph, so this is a dope inclusion. Echoing B/W over color for that back-up.